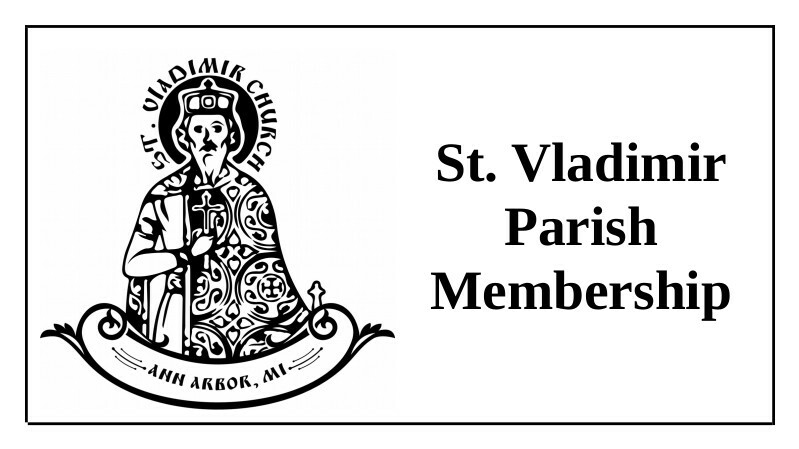 ARE YOU A MEMBER OF ST. VLADIMIR'S? JOIN OUR PARISH FAMILY! By joining St. Vladimir's you show your visible support of the parish which nourishes you and your family spiritually. We all hope the parish will be there when we need it (for marriages, funerals, baptisms, etc.). By joining the parish we support it both spiritually and financially and ensure it is there for us in our time of need, whether that be every day or a few times per year. To renew your membership or to become a new member, please contact one of our membership coordinators (all speak English & Russian fluently): Vasiliy Krivtsov (vasiliy.krivtsov@gmail.com or 734-669-8712), Dmitry Knysh (dmitriknysh@hotmail.com or 734-358-5996), or Konstantin Poplavsky (kepoplavsky@yahoo.com or 419-344-2071). We cordially invite you to join our parish family! We ask a membership donation of $55/year for working adults or $27.50 for non-working adults. That is sybolic, of course ($1 or 50 cents for 52 weeks of the year, Nativity of the Lord, Pascha, and St. Valdimir Day's). You'll see from our Membership Form we ask you to fill out below (English & Russian) that in addition to this symbolic amount we ask our members to support the parish by establishing a tithe. Like to learn more? Contact one of our Membership Coordinators or send an email to info@stvladimiraami.org or send us a text or give us a call at 734-475-4590.